The Roaring Fork Valley is surrounded by dramatic mountain ranges; it’s no wonder why hiking in Glenwood Springs is a popular activity. If you pick up a guided brochure on local hikes, it might be a bit overwhelming. With trails in every direction, it’s hard to pick out what treks will be best for your group – especially if you have other adventures planned during the day. Here are a couple of our favorite hikes in Glenwood Springs, so you’ll spend less time in the car and more time hoofing it toward the summit. Click the trail title to learn more details about the hike and to find directions to the trailhead. 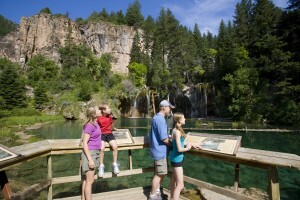 If you’ve heard of Glenwood Springs, you’ve probably heard of Hanging Lake. Situated on a geological fault line in the remarkable Glenwood Canyon, this is a hike in The Rockies you’ll never forget. The trailhead is only a few miles east of Glenwood Springs, and the hike is about two miles in distance. Though, don’t let the short distance fool you. During the two miles, you’ll ascend more than 1,000 feet. That’s no cake walk if you’re from lower elevation. Fortunately, the Hanging Lake trail is impeccably maintained with many benches and scenic overlook for resting along the way. At the summit, a cool, spectacular turquoise lake greets weary hikers. Don’t pack your bathing suit just yet, though; the lake is only to admire, as swimming in Hanging Lake is strictly prohibited (and far too cold!). 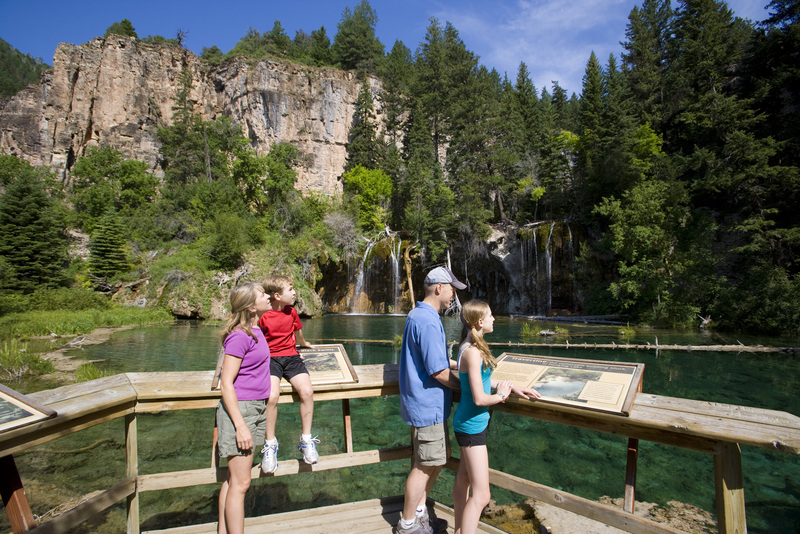 Starting in May 2019, in order to protect the natural resource and maintenance of the trail, reservations will be needed to hike Hanging Lake. You can also arrange a bike rental and shuttle from us and ride back on the popular Glenwood Canyon Trail into town after you hike. LINK TO RESERVATIONS COMING SOON. If you grew up in Glenwood Springs, you surely have early memories of a lit cross high on Red Mountain that glowed over the city during the night. None of us knew exactly how it got up there, and who possibly plugged it in every night – but it was always comforting having that iconic symbol greet you when the sun went down. Though it’s probably not as nostalgic to our visitors, it marks the summit of this next trail. Red Mountain Trail is a great hike for those who like to take long walks. While the trail is not a difficult hike, it is more than five miles to the top. Red Mountain Trail is on a private road – perfect for adventurers who didn’t pack heavy duty hiking boots. It winds through switchbacks across the mountain boasting spectacular views of Glenwood Springs. This is a great trail for mountain bikers as well, with more rugged trails leading off of the main, gravel one. If you still want to take in the views, but with much less walking, check out our Red Mountain Segway Tour. Storm King Mountain Trail is a memorial to the tragedy that occurred on Storm King Mountain in July of 1994. Just west of Glenwood Springs in South Canyon, a great wildfire spread rapidly across the mountain, taking the lives of 14 firefighters. Though it’s a melancholy memory for many people in Glenwood Springs, volunteers and BLM keep up this trail in memory of those who gave their lives to protect this beautiful little town. The hike up Storm King Mountain pays homage to the heroes’ courage and educates visitors about wildfires in the Glenwood Springs area, and how the natural habitat recovers. This hike is not as steep as Hanging Lake, but you’ll still gain quite a bit of altitude over the four mile trail. It is also, for the most part, unshaded, and can get quite hot in the summer. Pack some snacks and water for the trek as the trailhead is a couple miles from the city and not near any shops.